It’s 1983 (you know, like 1984, only trying to get a head start), and there’s this extremely strange institution called Arboria. It seems to be medical, feels penal, and has self-actualization written all over it. Equally devoted to surveillance and healing, Arboria is full of womblike, sparsely furnished rooms. Call the décor Siberian Modern — or Sci-Fi Sedate. There are a fair number of ducts, too (very useful if a person were, oh, say, trying to escape). Trees have nothing to do with Arboria’s name. The place has about as much to do with anything organic as Cheetos do. The name comes from its founder, Dr. Mercurio Arboria (Scott Hylands). Still on the scene, he’s grown feeble in old age. So the man who runs things is Dr. Barry Nyle (Michael Rogers). He looks like Steve Jobs’s creepier older brother, right down to a penchant for dark turtlenecks. Nyle’s main focus is a young female patient, Elena (Eva Allan), who seems catatonic, drugged, or both. She also happens to be telepathic and telekinetic. With Elena, the talking cure is a prescription for trouble. Arboria is “the path to a new, better, happier you,” its founder announces in an introductory promotional film that’s a bit like one of those Dharma Initiative instructional films on “Lost.” Better, maybe; happier, no. In his debut feature, writer-director Panos Cosmatos shows a knack for mood and tone. He does brooding menace very well, infusing a movie that has hardly any action (or, for that matter, dialogue) with a near-constant sense of expectancy. Synthesizers dominate the sparse score, and Quaaludes seem the pharmaceutical of choice. 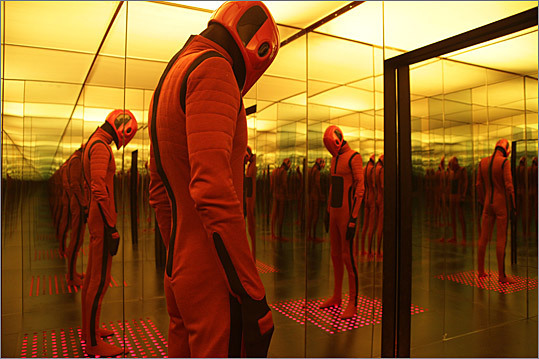 “Beyond the Black Rainbow” has a doomy, dreamy, druggy, draggy feel that’s impressively sustained — until it becomes oppressive, then pointless, then laughable. In a filmmaking world where feature length is a near-universal standard, it verges on insult to say that a movie would have worked a lot better as a short. But that’s the case with this one. It’s a midnight movie that doesn’t make it much past 12:30. Cosmatos clearly knows what he wants to do. He’s not making this up as he goes along. He has a vision, or rather several (they come courtesy of the young George Lucas, the middle-aged Stanley Kubrick, David Lynch when distracted, and David Cronenberg pretty much round the clock). But is what he wants to do worth doing? Cosmatos has a weakness for close-ups — close-ups of eyeballs, pills, fingers, cigarette ash, telephones, needles, syringes, toes, tweezers, contact lenses, insects, turning sprockets on a cassette player. In the hands of another director, such serial specificity could come across as an exalting of the physical world. With Cosmatos, it seems like a mild autism. He also has a weakness for all sorts of visual devices: colored lenses, diffusion filters, slow motion, double exposures, fades to black. It’s as if he’s trying to compensate for so little happening in his plot by having so much happening in his visuals. It’s like a film-school fever dream. Hey, maybe that’s what Arboria really is, a film school, and you don’t want to know how many credits it takes to graduate.